What better way to introduce you guys to one of the best party planners I know than with details of a unique party? I dare you to not smile ear to ear while looking at this fun yet sophisticated cake smash for a milestone celebration. Pooja poses for a trend that is fast catching up, #adultcakesmash to mark her company's 5th birthdays. Trust her to know it is simply not fashionable to sit formally for a portrait. Adult cake smashes have sure gained popularity and offer an exciting and positive spin on birthdays but how do you do one without making it look crass. Do you wear the tiara and skip the tutu? Should have wine or champagne? Read on for her tips on party planning and her favorite moments from Confetti’s milestone Birthday. Happy Birthday to Confetti! How did you come up with the idea of a cake smash party?What was the inspiration? Pooja: Thank you, Krupa! Confetti has grown tremendously since it first started 5 years ago. From a small store of handmade artefacts, we now spread our colors in the form of styling parties, proposals, date nights, photo shoots and cake smashes for babies. The 5th year marked a special milestone for me and I wanted to do something fun to celebrate. While discussing with a friend on ideas for a picture, he proposed we think on the lines of what a 5-year-old would do - and bam! I thought of a cake smash for adults. While there is a growing trend in India for cake smashes for 1 and 2-year-old babies, we haven't seen many adult cake smashes and this was a great way to get adults in on the fun! Who doesn't love some good ol' cake? It was the perfect way to represent what Confetti stands for - a unique and fun celebration of YOU. What is the key to nailing an adult cake smash shoot? Pooja: Since Confetti is all about color, we decided to keep the set very colorful. However, I would suggest stick to a color scheme. Start with what you want to wear, and it can be ANYTHING that you're comfortable in. I choose a turquoise blue dress from 5 years ago and decided to match my cake with it. The rest of the decor was a mix of pinks and yellows. Of course, pick a flavor you like cos if you're taking as many takes as we did to get the perfect shot, you're going to be eating a lot of cake! We chose a giant cupcake shaped cake and blue champagne bottle to match. We even added a milestone poster (that we usually design for children's birthdays) to mark our 5-year milestone. Balloons, a cake stand, a teepee and some giant handmade flowers can do the trick of a perfect set-up.You can even add handmade pom poms, lanterns, bird cages or metal trunks as well. Just make sure it isn't too many things - pick any 3-4 and you're good to go. A tiara always adds to the glam! How can our readers get into the setup? Did you have any DIY project ideas to pull this photoshoot together? Pooja: If you live in Bangalore, you're in luck! All the props required to set-up a fun cake smash are available at Confetti. However, if you're fairly craftsy and would love to make your own props you can check out YouTube tutorials on how to make tissue paper pom poms and giant paper roses. We hired the uber-talented Dhruva from DLS Clicks Photography to do our photo shoot as he has immense experience (and patience) in cake smash shoots. The key to great photos is, of course, a great photographer - so don't compromise on that. Be honest, what did you do with the cake? Pooja: We tried to take suggestive shots instead of actual shots of me smashing my face into the cake 'cos maaaybe not everyone would like to see that. What happened to the cake after is best left a secret (lest all my friends who ate it all up at the sleepover that night might be reading this). What will you always remember about this photoshoot when you look back at it? 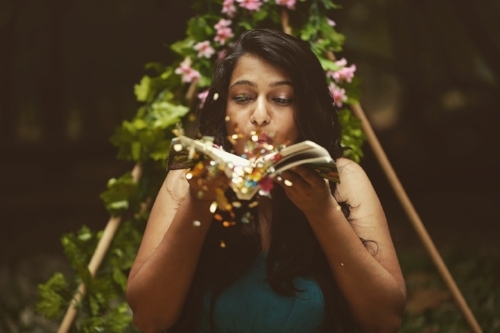 Pooja: The fact that I could re-live being a kid again without a care in the world. Bubbles, Cake & Confetti - nothing makes me happier. What are your five favorite milestone cake smash props? GO! Pooja: Giant foil numerical balloons, a fun colored metal trunk, a teepee, Champagne, and Confetti. Thank you, Pooja for teaching us to have always have fun and spread joys like Confetti. 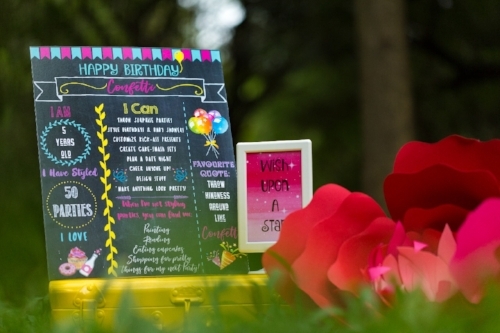 You can reach Confetti here or follow their awesome parties and ideas here.